For the past four months I've been a digital nomad, traveling and working remotely from wherever I am. As a programmer, I'm grateful to do work that largely doesn't require a physical presence and for which bits traveling wirelessly earn me an income. Though most folks claim it's an incredible time to be a programmer from a career perspective, I value the freedom/flexibility aspect of being a programmer in 2013 far more. I set out to take advantage of that freedom at the end of May, and haven't looked back. Developers seem to rarely use validates_lengths_of with their models, despite there being an inherent maximum length on every string and text field - the one enforced by the database. Since table migrations in Rails set a fairly high maximum length for string attributes, most people don't think twice about the possibly of that limit being exhausted. Even beyond this, there may be other reasons why the field limit is set fairly low, or perhaps you're working with a legacy database. Six years ago I moved to Rochester, a city that at the time I had only vague recognition of, to start my life as a college student at RIT. In those past six years I've gotten to know and grown to like the city I began my "adult life" in, despite the horrid winters. Having grown personally a great deal in Rochester over the past six years, I've come to consider Rochester my "home" (over my parents' home in Williamsport, PA). After college, I decided to continue working independently based out of Rochester to do freelancing full-time. Since then I've had the opportunity to meet and work with many great people, especially at Coworking Rochester, who have greatly enriched my daily life. I ran into a problem a while back of creating draft copies of ActiveRecord models for the purpose of establishing a draft/live system. I've since found a reason to resurrect this and publish it to GitHub and clean some things up. Check out has_draft on GitHub. The addition of named_scope in Rails 2.1 has revealed several elegant approaches for modeling complex problem domains in ActiveRecord. One I came across recently while working on an app with a somewhat complex permissions system was a permission-based filtering mechanism. In this case I was dealing with permission for a given user to manage an "office", while a user could be at one of three permission "levels", one of which has specific office assignments (or it's assumed all are manageable if user.can_manage_all_offices is true). Lot's of necessary conditional logic there. I fairly often use the acts_as_tree plugin in my applications. While acts_as_nested_set (and superior variants..) is more powerful, often times a simple two-level deep hierarchy is all I need and acts_as_tree is simple. I've found the new named_scope functionality in Rails 2.1 to be very helpful when dealing with tree data structures. Since working with Ruby and other dynamic languages, I've thought a lot about the differences between statically-typed and dynamically-typed languages and what makes them different. Statically-typed languages guarantee some level of confidence of workability -- but this comes at a huge cost of flexibility, and more importantly overlaps with software testing, not making efficient use of the concept of testing. A very common paradigm in web application development is presenting the user with some sort of alert or flash message at the top of a page. These alerts are often styled with a background and some sort of icon to the left to indicate what type of error it is. 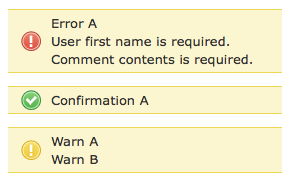 Typically there are a few different types of messages such as "error", "warning", "confirmation", etc., perhaps each type styled differently. Furthermore, such a block typically should support showing a set of messages within one type; not just one string. In Rails the two sources of these messages are usually either the flash object (such as flash[:error]) or ActiveRecord validations errors. Don't use symbols for route parameters! So today Rails 2.0 was finally released; it seems as though the Rails core team has been polishing this up for ages. I don't think there's a whole lot to get excited about. In short, Rails 2.0 gives you better opportunity to make use of best practices, such as using the will_paginate plugin instead of build-in pagination (Rails 2.0 drops pagination support from core). Support for RESTful development is much improved, allowing more flexible route declarations and finally dropping the annoying semicolon separator for the edit action: projects/1;edit. I've been wanting to start a Ruby on Rails blog for a while to document my experiences using the framework and engage with the community, but always felt I wouldn't have enough time to maintain it. Today I decided to give in and begin RailsGarden.com.